The four crazy wizards from Magicka return to save the world all over again. Paradox Interactive had a breakout hit on Steam with Magicka nearly 4 years ago. Before that, the veteran publisher was mostly known for strategy games, but the 4 player co-op action title Magicka was the company's first million seller. It was even more amazing when at E3 2014 the sequel was announced on a very big stage at the Sony Press Conference. The team developing the game for a release on both PS4 and the PC are working hard to provide the consistent laughs that only Swedish wit can deliver while also adapting the control scheme to play on a console for the first time. I got to play a short mission at PAX Prime 2014 with some colleagues and we had tons of fun blasting each other, and sometimes the bad guys. 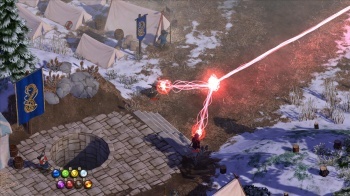 For the uninitiated wizard, Magicka uses 8 elements and you can combine them for various interesting effects. Use fire, for example, and a jet of flame will shoot out, cause fire damage and set things on fire for damage over time. Use water, and that jet will be water instead, and will douse things on fire. Use lightning, and anything that's wet will take extra damage. You can also use life and cast on yourself to heal, or shoot out a beam of life energy to heal your friends. It's a complex system, but once you get the hang of casting it can be incredibly deep and engaging. Magicka 2 takes place after the events of the PVP title Wizard Wars - with all of the magic-users deceased. Somehow, they are resurrected to contend once again with Vlad, the guy who is still not a vampire. The story is full of references and silliness; the mission we played began in a snowy setting with a character called Jack Snow behind a small wall he was asked to defend. We ran around for a while testing the magic system on the PS4 controller. It does have a steep learning curve, perhaps more than the keyboard and mouse. Using combinations of button presses before you can do what you want will take some serious practice. That said, I could see the advantage of the PS4 controller in some aspects, like easier movement while casting on yourself or in a beam. To spruce up the sequel so it's not just "more Magicka", there's a whole new artifact system. Artifacts are unlockable items which can offer mechanical benefits or just be funny. A few examples given were a sitcom artifact that adds a laugh track to the game, or an artifact that makes all the wizard models blow up to look like inflated marshmallow men. You can get some artifacts through normal progression, but some can only be found by solving environmental puzzles or completing challenges. One such challenge was at the end of the mission we played in Magicka 2. A statue was there with two glowing globes that matched the colors of two of the elements you can cast. Hitting the statue with those two magic elements opened up an event with tons of demons attacking the party of wizards. We died pretty quickly, possibly because I realized too late that beaming the death element healed these buggers, but it was a nice way to reward optional play nonetheless. Look for Magicka 2 to release in early 2015 on PC and PS4. There's no exact word on pricing, but it will likely be in the $10-$20 range. For a minimum investment, Magicka is tons of fun and I think the sequel will be too.